Join us this month as we livestream from Kenny's location. What questions do you have for the Plumbing and HVAC guy? Submit them here. We'll be sure to have Kenny address them. A second generation Master Plumber and Mechanical Contractor, Kenny Hart has nearly 40 years of experience in the mechanical fields. He holds a Master’s License in plumbing, HVAC and gas-fitting. He has been certified by the Commonwealth of Virginia as a backflow device tester. Kenny is a Virginia Licensed Home Inspector and a Past-President of Hampton Roads ASHI and the Virginia Association of Real Estate Inspectors. He served on the ASHI Technical Committee for three years including one year as the chairman and has also served on the ASHI membership and standards committee. Kenny is a former member of NAHI and has been a member of InterNACHI for nearly a decade. Kenny served as the Chair of the Trades Division of Alpha College of Real Estate in Chesapeake, Virginia for four years. He served as the Chair of the Trades Division of Alpha College of Real Estate in Chesapeake, Virginia for four years. During that time he produced and taught continuing education classes for tradesmen, home inspectors and real estate agents. While working with Alpha College, he also wrote a monthly column for the Hampton Roads REALTOR® where he discussed common building practices, home inspection and trade issues. He is a regular presenter at home inspector, trade and real estate events. 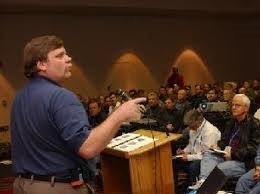 He has made presentations at numerous ASHI events including nine Inspection World Conferences. Kenny is a contributing editor to the ASHI@Home Home Inspector Training Program. He has had more than a dozen articles published in the ASHI Reporter and has written for the NAHI Forum as well. Kenny has also authored and contributed to technical articles for several major magazines Including; the Journal of Light Construction, Drinking Water and Backflow Prevention and Popular Mechanics.